For one of the most commonly taken supplements, preworkouts certainly carry high expectations. We want them to give us insane energy, crazy pumps and vascularity, and increase our focus, all without any sort of crash, jitters or side effects once we leave the gym. But outside of Beta Alanine to give you that tingly feeling and a jolt of caffeine for energy, the nutrient profile of preworkouts tends to fall to the wayside in favor of more exciting supplements like test boosters and fat burners. 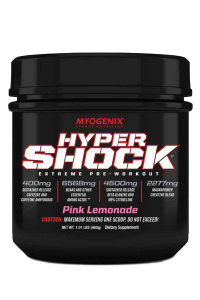 Myogenix wants to alter that perception with Hyper Shock: a fully loaded preworkout that provides long lasting energy, electrolytes and muscle growing nutrients. Rather than relying on a high dose of caffeine, Hyper Shock contains a sustained release formula to provide energy lasting up to seven hours to not only get you through your toughest workouts, but the rest of your day as well. Unlike other caffeine-based supplements there is no “crash”, so there’s no threat to any activities you have planned after your gym session – like work, you know that thing you do to pay for your supplements. Beyond the energy and electrolytes, Myogenix has ensured that Hyper Shock delivers on value from a nutrient delivery standpoint in comparison to other preworkouts. It contains a full complement of BCAAs in addition to several other amino acids which are proven to increase strength, size, and power, as well as improve overall performance. They also added a healthy dose of creatine which, alongside betaine, serves to prolong stamina during intense training and aids in greater protein synthesis. Only you can decide whether Myogenix over promises and under delivers or not with Hyper Shock. Try it for yourself, available now at Strong Supplement Shop.